Place a large cookie sheet on the middle oven rack and preheat oven to 425. Unroll pie crust and place in the bottom of of a 9-inch pie plate. Crimp the edges of the crust and pierce holes in the bottom of the crust with the tines of a fork. In a large bowl, whisk together the heavy cream, sugar, flour and vanilla until smooth. 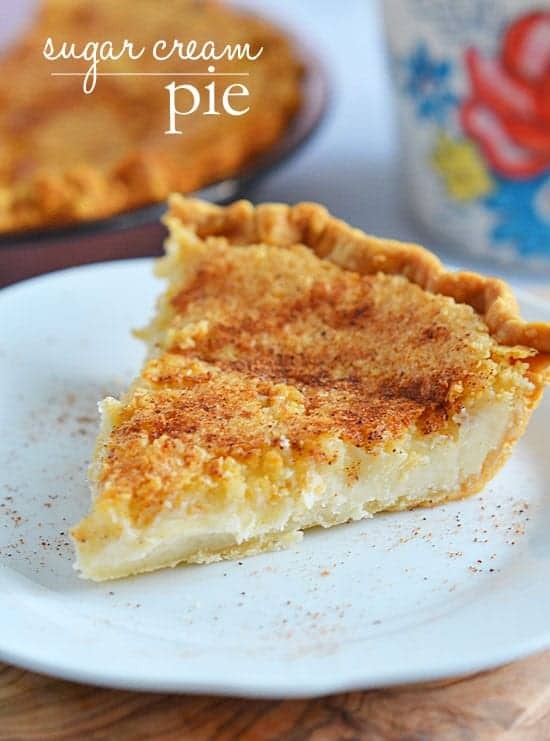 Pour the mixture into the crust, dot with butter and sprinkle the top with nutmeg. Carefully(!) transfer the pie plate to the preheated baking sheet and bake for 10 minutes. After 10 minutes, reduce heat to 350 and bake for an additional 55 minutes - or until the crust is lightly golden brown. The center will still jiggle slightly - that's okay. If the edges of your crust are browning too much, cover the edges with foil. Transfer to a wire rack and allow pie to cool. May be served chilled or at room temperature. Refrigerate leftovers.